Click HERE to hear Unvarnished five days early! USAToday.com is streaming Unvarnished on their website from now until September 29th! Aside from collaborating with the Foo Fighters’ Dave Grohl and her longtime writing partner/producer Kenny Laguna, Jett also wrote with bandmates Dougie Needles and Thommy Price, a first that she’s especially excited about. Once they finished writing in summer 2012, Jett and the band recorded the album’s 10 songs (and four bonus tracks) through the fall and spring. In crafting Unvarnished, the goal was to make the record “sound representative of what you’re going to hear at a live show,” Jett says. In order to achieve that, the band incorporated new tracks into its live sets before even stepping inside a recording studio. This allowed them to not only get a feel for the new material in a concert setting, but also gauge audience response. 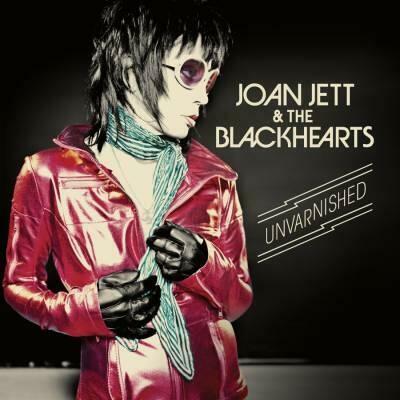 Although one track, Everybody Needs a Hero, is a notable shift stylistically — incorporating strings, oboe and English horn — Unvarnished still boasts the signature sound fans have come to know and love from Joan Jett & the Blackhearts. This entry was posted in Album News, Articles and tagged Joan Jett, Unvarnished, USA Today. Bookmark the permalink. Get the BEST BUY EXCLUSIVE edition of Unvarnished!